This is a comprehensive and flexible agreement for leasing any vehicle whether new or used. The type of vehicle does not matter. The vehicle could be of any size or type, from a small car to a delivery scooter or can be a van, flatbed lorry or vehicles used for transportation. The lease period may range from months to years. Despite whatever may be the length of term, a well drawn agreement protects you and the vehicle - your asset in all ways. Like this one! Using an agreement such as this one provides both sides with a record of the arrangements and the condition of the vehicle, helping to prevent and more easily resolve disputes. To make your life easy, we have provided multiple options in many areas including responsibilities for maintenance, payment of the lease, options for buy-out at the end of lease, options to extend and much more. By and large, you can set the terms you want, particularly the commercial ones. The document should be edited so that it reflects exactly how your business works. Our guidance notes will tell you what you can change safely, and what we don't advise changing. This agreement can be used by any person, business or other organisation to lease to a business or individual. a business owner who leases his personally owned car to his business. a company with an unused delivery van who leases it to another company (perhaps in the same group of companies). Within a group of companies to move profit around the group for any reason. The terms of this agreement are based on common law that deals with the basics of contracts: offer, acceptance, price and payment, provision of service, liabilities and risk. This lease agreement does not take account of consumer credit and other consumer protection law it cannot be used for hire to consumers. 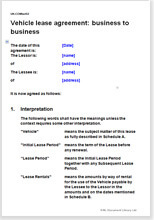 This vehicle lease agreement is extremely comprehensive and written in plain English. It has been drawn for maximum flexibility and ease of use. The term of the lease can be as long or short as you like, from months to years. We suggest a short period so that the contract can be renewed and terms (such as the rental amount) updated. Segregation of legal wording from the subject matter. The document allows use of several schedules to record the detail of the agreement. This keeps the "legal" wording of the commercial transaction separate to the "subject matter", creating an agreement that is easier to read, amend and reuse. The document may be used regularly or once only for a particular deal. Flexible rent and payment plans. The rent might be a simple monthly or annual payment or may be variable. The buy-back arrangement is an option you can include or delete. Use Office equipment lease agreement to lease or to rent any type of office equipment to another business. It could be used by a director or shareholder lending to his own business, a professional leasing business renting on a commercial basis, a business that wants to make good use of spare equipment, or as a record of within a group of related companies. It is suitable for any type of equipment, from mobile phones, to computer hardware, to furniture. The document is suitable for both long and short term loans.